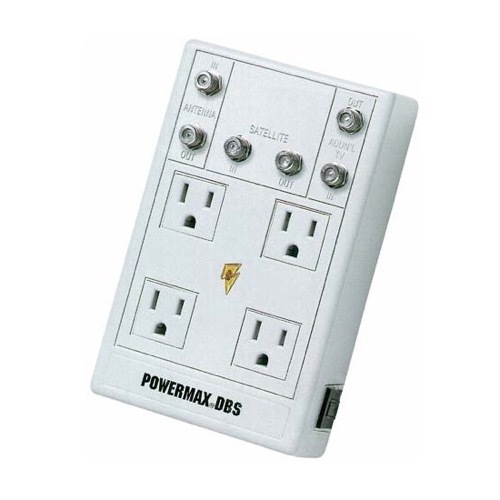 Complete satellite and connected equipment protection With a one nanosecond response time, the POWERMAX DBS+ provides electrical surge protection for 4 AC lines (television, stereo and VCR hookups), 1 satellite coaxial line, 1 cable TV (antenna) coaxial line, 1 additional TV coaxial line and 1 telephone line - all in one compact unit. Panamax exclusive expanded warranty covers DBS receiver and LNB for 5 years. Not only do you get the best protection, you get the best warranty. While connected to the POWERMAX DBS+, your DBS receiver and LNB are guaranteed against damage from an event of electrical origin, including spontaneous component failure. Lifetime product and $100,000 connected equipment warranty.